Pressure-cook the pigeon peas in 500 ml water, for about 20 minutes and till they are cooked and well done , kind of mashed in consistency . Add the sugar and keep stirring on low heat making sure that the lentils don’t burn and till the bubbles disappear. Then add gram flour and continue to stir. Mixing all the gram flour into the lentils and sugar mixture. Add cardamom, keep stirring till the mixture thickens and coats the back of the spoon. Allow the mixture cool in the refrigerator covered with saran wrap for about 30 minutes. In a mixing bowl take wheat flour; add ¼ to ½ cup water and 1 tsp oil to knead a dough of medium texture, neither too soft nor too hard. Divide the kneaded dough into equal-sized tennis ball round portion. 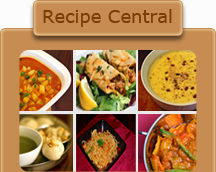 Using a rolling pin, roll out semithick roti (Indian bread) of 5 diameter and ½ inch thickness. Fill the center of the rolled roti with 2 tsp of the cooled filling. Bring together and Seal the mixture in the center and form a tennis ball like shape again, flatten the top a little with the palms of your hand and roll again to ½ -inch thickness. Heat griddle and cook the on both sides so as to brown it on both sides. 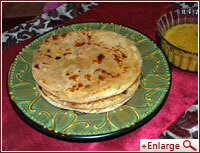 Remove from heat and put 1 tsp ghee on the surface of hot roti.